The patterns below illustrate the main spray pattern formed by the AK-47. 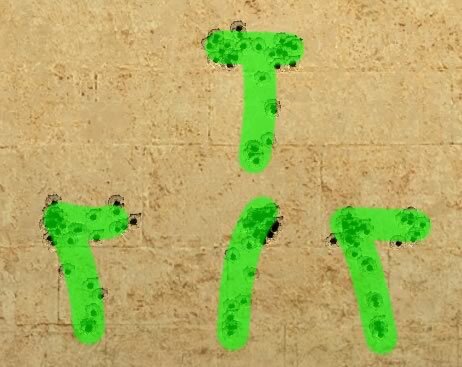 The bullets raise from where you aim and alternate from left and right, however, the lower center pattern has stayed to the right. Using bursts of 2 to 3 bullets is a much more effective way of killing players than spraying, the screenshot below shows the bursts of 1, 2 and 3 bullets from long range. As you can see the single shots and 2 bullet bursts are very accurate, and the difference between between them is indistinguishable (the single shots look worse because there are less bullets), but the 3 bullet bursts are more spread out. The table below shows the damage done to players by the AK-47. This was tested against 20 bots to check for consistency. The AK-47 is the most popular Terrorist weapon, besides the AWP. At close range it is recommended that you crouch and spray, but from medium to long range use bursts of 2 to 3 bullets (as these are the most accurate). This is also one of the guns where "Stop Missing Your Flick Shots" is vital.